Maybe you thought Deep South Pout was for college girls but... Fashion Finds for any age! !PLUS I have a discount code for you. I have been a Deep South Pout fan since day ONE! It is located in the heart of downtown Starkville MS. For my fashionista who might not live in Ms that is the hometown of MSU. Deepsouth Pout has a darling storefront and a great website for those who love to shop online. I partnered with them to show you some really fun fashion for any age. The first look is this mustard floral maxi. I paired it with a denim jacket and the it purse of the season. At first I wasn't sure about the bell bottoms but as you can see I am rocking them!!! I am so glad I gave them a try! This floral bomber jacket is my new favorite item in my closet right now. The off the shoulder jumpsuit is so feminine. I feel so stylish in this. It just has a vacation feel to it. The striped and floral combo (which is a great combo) off the shoulder top could be paired with so many things but today with the warm weather I had to pull out the cut-offs. 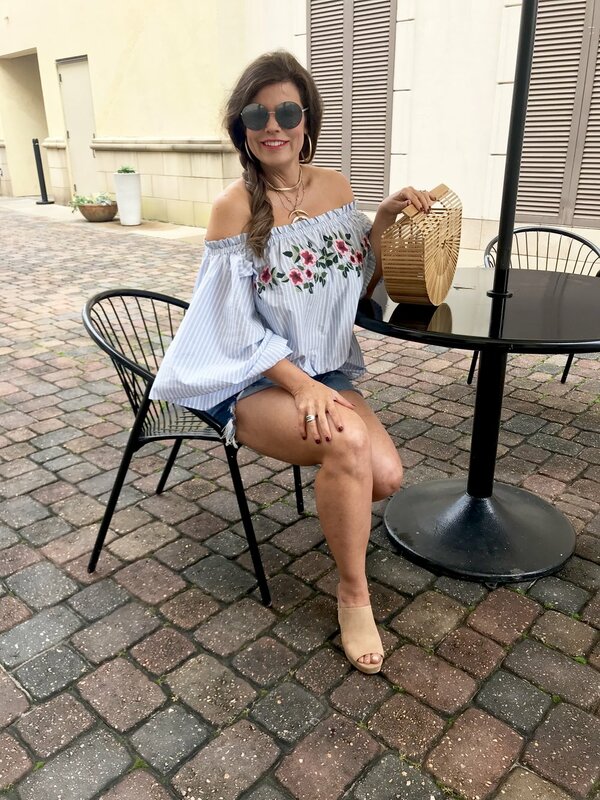 This sleeveless floral ruffle top falls just right to slim the hips and thighs. I could just throw all this in a suitcase and have everything I needed for a weekend getaway. Deepsouth Pout is giving all of my followers a Discount put in the code of jane20 for 20% off any purchase of over $4o good thru March 17th.If you go to Starkville there are so many fun places to shop now. I also always eat at one of my favorite spots the Veranda. Thank you for following me and check out Deep South Pout on FB and Instagram. Floral Top- They have re-ordered and it will be on the webssite soon! The Best White T-shirt ever made (super flattering on everyone) and ideas that will have you adding stripes to your wardrobe for the spring.